Local artist J. Augustus Beck sculpted the wreath in 1854. Gravestones provide one of the most accessible and intimate connections to the nineteenth century. However, the personal, commercial, and artistic decisions behind them rarely show up in research, so I jumped at the chance when I accidentally ran across an article in the May 16, 1854, Lancaster Intelligencer while pursuing another research tangent. In an article that led with "Lovers of Art" that the Intelligencer actually copied from the Inland Daily, a couple items in the marble yard of Lewis Haldy on North Queen Street received attention. The first was actually a relief sculpture by J. Augustus Beck -- son of the noted artist from Lititz -- on its way to the Washington Monument. Commissioned by the American Medical Association via Dr. John L. Atlee in 1852, Beck's sculpture depicted Hippocrates refusing the gifts of the Persian King Artaxerxes meant to entice him to provide medical aid to his country's enemies. The newspaper reported, "The execution of the work is in the highest style or art, and evinces extraordinary talent in the artist." Some sources indicate that the sculpture is still in the Washington Monument in very damaged form and others say that it is in the Smithsonian Institute. We might mention several other fine specimens of art, the productions of this talented young artist, which may be seen at the same place. Among other things we note a beautiful wreath--the prettiest thing of the kind we have ever seen. It is engraved on a marble slab, and designed for the grave of the late Mrs. Gemperling, whose remains repose in the Lancaster Cemetery. Jacob Gemperling, grandfather of Henry Clay, who was a distiller and farmer, was born near Rohrerstown; his son Daniel, who was born in Lancaster, died Nov. 13, 1895 at the age of eighty-seven years. The latter and his brother John, were the leading tinsmiths of the city for many years, filling many important contracts. Daniel Gemperling conducted the business on East Orange street alone to within a short time of his death, and became one of the best-known citizens of his time, owning a large amount of real estate, and making his influence felt in business and commercial circles. Anna Hurst, his wife, was a half-sister of Elam Hurst, a prominent citizen of Lancaster, and also a sister of the mother of H. C. Demuth. From this union were born three children, two of whom, William and Anna, died in early childhood, and the only survivor is Henry Clay Gemperling. Henry Clay Gemperling was born in the large brick mansion at the southwest corner of East King and Jefferson streets, then the home of his parents, in February, 1846, and was educated in the city schools and at John Beck's celebrated school in Lititz. When less than sixteen years old he left school to enlist in the Union army, joining Co. A, 79th P.V.I., Aug. 19, 1861, and served throughout the war, receiving his discharge Aug. 12, 1865. He took a gallant part in all the battles and skirmishes in which his command participated, and was wounded in the arm at Jonesboro, Ga., under Gen. Sherman, being promoted to the position of corporal. After the war Mr. Gemperling was captain of "The Boys in Blue," a campaign organization in the first campaign of Gen. Grant for the presidency. After Gen. Grant's election the boys in blue were organized into two military companies, A and B, and attached to the National Guard of Pennsylvania, Mr. Gemperling being commissioned captain of Co. B, both companies taking part in the inauguration of Gen. Grant as President. Until 1879 he worked with his father at the tinsmith and plumbing trade, and then removed to Ephrata, where he engaged for himself in the same lines. There he remained until March 13, 1895, when he returned to Lancaster, to become a tip-staff in the court house, very shortly being made a court crier for court No. 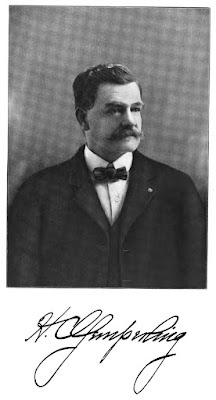 2, and in November, 1899, he was made court crier of the courts of Lancaster county, to fill a vacancy created by the death of Joseph C. Snyder, a position which he still holds. While living in Ephrata, Mr. Gemperling bought and remodeled a fine property. For fifteen years he was a deputy coroner of the district, for nine years he was a notary public, and was the first president of the Pioneer Steam Fire Engine and Hose Company, and was acting in that capacity, when he left the borough; he was commander of Post No. 524, G.A.R., of Ephrata, for three years, and was the second man to be elected burgess after Ephrata became a borough. While a resident of Lancaster he served as a policeman during Mayor Stauffer's first term, and is remembered as one of the best police officers this city ever had. During his residence in Ephrata he twice arrested Abe Buzzard, the noted outlaw, "putting him behind the bars." This he did as a private citizen, his fellow townsmen calling on him because of his well-known fearlessness. When thieves broke into the store of Schaeffer & Reinhold, at Ephrata, Mr. Gemperling discovered one of the thieves, arrested him, and took him to jail. This same bravery was conspicuous through his army experiences. Mr. Gemperling was married Aug. 14, 1869, to Miss Susan Jacobs, daughter of William Adam Jacobs, a farmer living near Beartown, Lancaster county. From this union were born four children: Anna Maria, the wife of E. E. Royer, a farmer of Ephrata township; Martha Alpha, unmarried and at home; Daniel H., a paper hanger; and Henry Clay, Jr., now at school. While on the subject of the Gemperling family, you may note that another soldier with the surname Gemperling served in the 79th Pennsylvania. William Gemperling also enlisted in Company A with Henry Clay Gemperling. William Gemperling was wounded at the Battle of Chickamauga. He died a year later in the Andersonville prison, although I'm not sure if he was captured at Chickamauga or elsewhere. I also cannot establish the relationship between Henry and William Gemperling, which I guess to be first or second cousins. If anyone knows more about William Gemperling, feel free to leave a comment below.